F U! F U! F U! Yes, YOU! Sigh…Sometimes cussing rampages just aren’t enough. And maybe your emo tunes and stress balls aren’t cutting it either. Enter FU Rant, Vent & Get Even, the perfect way to digitize and release your tension. Just take a pic of the offending situation (your overbearing boss, your crazy ex, the neighbor’s Chihuahua that won’t stop yapping). Use the photo-altering menu to resize and add an arrow through the head, the middle finger, a piranha getting ready for its next meal, and more! Fill in text bubbles to include some original colorful commentary. Link your masterpiece directly to your Facebook and Twitter accounts to share your undoubtedly hilarious photo-editing skills with friends and family. And did we mention this app is ad-free? Well, of course! We wouldn’t want to be the cause of your frustration! 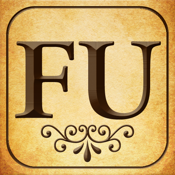 If your problems are specific, upgrade to the FU Job and FU Ex versions, specifically tailored to fit your venting needs (seriously, how was this not invented a long time ago?). Your iLife just got stress-free (not to mention more fun).